This entry was posted in ADVICE, Hack "Gurus", How To Avoid Investing Scams, Post RV Survival Tips, SKYPE ROOM ARCHIVE and tagged cbi, Central Bank of Iraq, currency revalue, Dinar, Hack Guru, IQD, Iraq, okie oil man, rv, Sudden Wealth Syndrome, SWS, Tony TNT by MrIQD.com. Bookmark the permalink. I read your posts with little interest for a very simple reason. They contain very limited value. Still I read as much info across the Internet regarding this speculative event as I have time in order to gain insight and glean some knowledge from many sources. My career background as an analyst disallows too much emotional response to all I study. Therefore, I have a suggestion that I think beneficial. Stop the negative ad hominem attacks on the “hack gurus”. Such argument offers nothing of value and completely discredits any attempts you may think helpful to your audience. I would also suggest you discontinue your arrogant posture communicated by blatant criticism of those who read the posts of these “hack” guru’s. In fact, you owe an apology to those speculators at large. I wish you the best and hope you consider posting information of value for those of us pursuing this event. I have learned much from many sources and look forward to learning something from your insight if you have it to offer. Thanks for your opinion, but due to the simple fact that HUNDREDS OF THOUSANDS of Dinarians have visited my website, and in turn THOUSANDS have benefited from my posture to EXPOSE THE LIES that are being told to them by the Hack Gurus, I respectfully will not take your “advice”. If you truly are an Analyst, as you claim, then you should be noticing the years of constant repeating of the same lies and non-truths being told by these Hack Gurus! As you will see, I point out almost to the day, a YEAR EARLIER, when a Hack Guru told some lie about the Iraqi Dinar’s Value! Often I found the lies to be nearly “WORD – FOR – WORD”!!! Imagine that, almost word-for-word repeating their lies, how brazen was that! Once I started exposing these lies, from my analysis, the Hack Gurus stopped being so obvious with their repeats of their old, original lies. Honestly, I am a bit surprised you didn’t have much interest in what you read on my site! So, you don’t like being told the truth, and where to find it? You don’t like me to tell you, and other Dinarians, to go to the http://www.CBI.iq website to find out what the REAL RATE of the IQD is? “I honestly 100% believe in the people of Iraq and the facts (from the REAL NEWS) that Iraq is turning around their society, politics and economy! I must say, those who are loyal to the likes of TNT Tony, DC, Okie, etc., will go to great lengths in protecting their fearless leaders while time and time again attempting and unfortunately succeeding in weaving a web of deception for the implicit purpose of indirectly luring the naive’, the hurting, the poor, the financially illiterate, the gullible, the needy, etc., to buy more and more Dinar, which most can ill afford to do, but do so anyway, because as OW stated: They want to be “instant scratcher lotto winners!” He further states that these mentioned above don’t want people thinking for themselves. The mind is a powerful asset, which if controlled by outside forces bent on manipulating facts can be hypnotized into believing any and all lies as if they were truth! How long does it take people to wake up and see that these certain persons again, so named above, keep feeding the Dinar community with the same outdated and ridiculous intel, which they have been doing for years. Yet, so many fail to take control or maybe want to take control of their own finances or lives and put all their “Dinar” trust in these persons who to me exploit the real meaning of honesty, trust and intel, which stimulates the GREED of not wanting to be left out and the need to have another “Dinar Fix”, to feel good and get another “Dinar Fix” and so on and on and on and on! I’ll end with this; “I’d challenge everyone to sit back and take a real assessment of their current “Dinar” position and ask themselves (be honest), just how many times has any of these persons who call themselves “Gurus”, been correct about the date and rate? If they were a stockbroker promoting a certain stock or industry and had to rely on the track record these guys have, they would have already found other jobs. Can you imagine buying a stock year after year, which produces zero return, yet your stockbroker keeps pumping the proverbial tree of GREED that if you don’t own it, you’ll be left out! Left out of what? That translates to just about any other type of job or occupation besides being a “Dinar” Guru, where one gets the luxury of being wrong 100% of the time, yet when challenged, always finds a way to conveniently throw their accusers under the bus instead of responding to the facts! Sounds a little like some politicians we all know! Ah, Dinar politics…. don’t you love it? 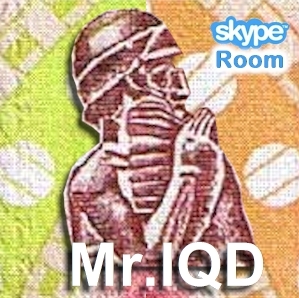 Thanks Mr. IQD for providing a much needed service, which allows both the good and bad comments to be voiced, instead of filtering only the ones that make the Guru or web site administrator look good! I think more and more in the Dinar community want the truth…. so how about it Guru’s? Wouldn’t it be better if and when the Guru has nothing to report, they say nothing instead of making up things, which they hope makes the Dinar community think they really are Gurus and know more than everyone else! Many of us know the truth! Many more are finding out the truth each day. Let’s keep the truth going! Thanks for your question, however I deal primarily with bashing the Hack Gurus who tell flat-out lies to Dinarians. I’m not a financial consultant, and even if I were, I would not be able to consult you with respect to your questions above, as you and I don’t have a “known client” relationship. I would recommend that you consult your local financial experts and get their opinions. I’m sure my readers and fellow Dinarians would love to find out what you learn from your research.